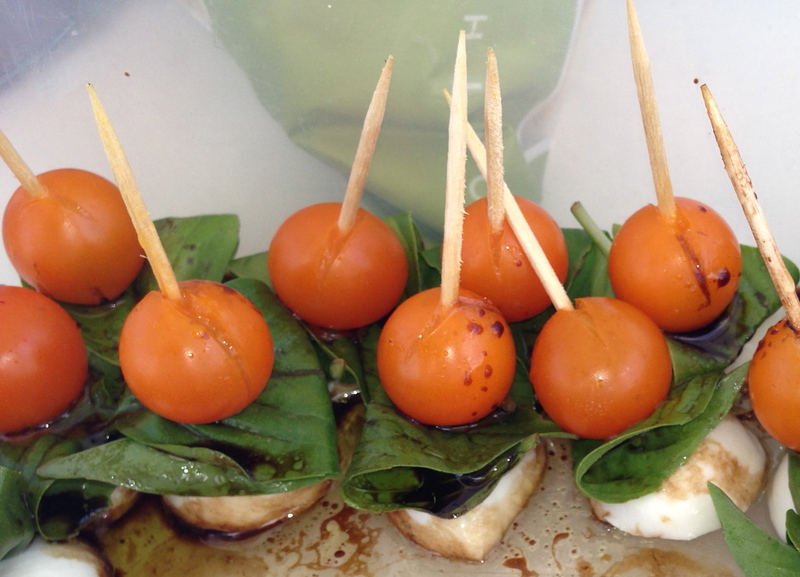 Assemble toothpicks with the mozzarella on the bottom, flat side down so it can stand. Then, fold one basil leaf in half and put it on the toothpick. The grape tomato tops it off. Sprinkle with salt to taste. 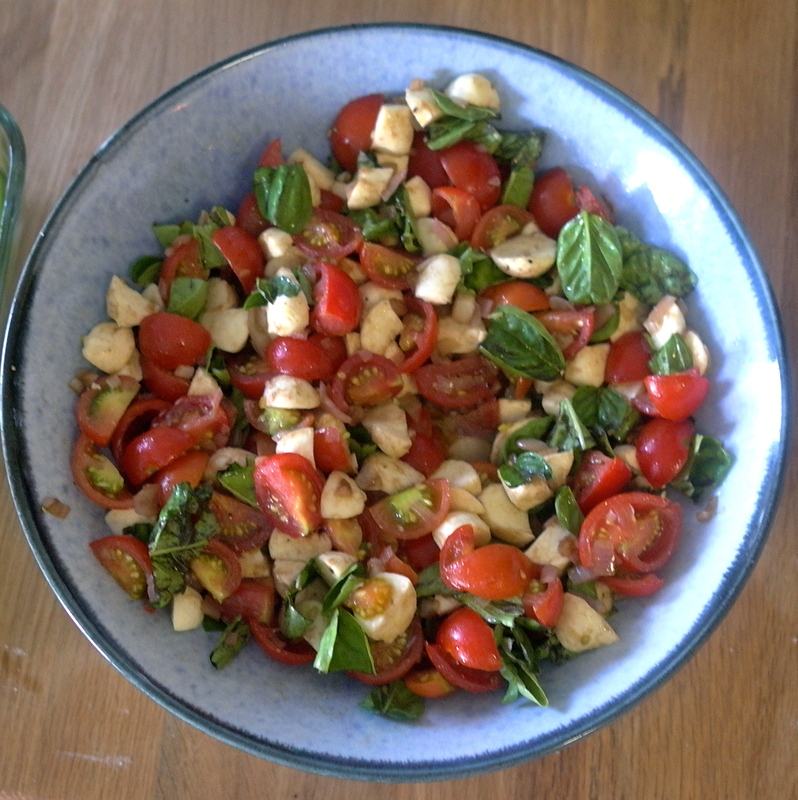 Just before serving, drizzle with balsamic dressing. The other option is chopped up vegetables and some great dressing as dip. I went with Sang Lee’s sweet ginger dressing. The farmer’s market had quite a selection for dippable vegetables today. I went with: wax beans, red and green bell peppers, burpless cucumbers and carrots. I also used some home-grown roma beans. 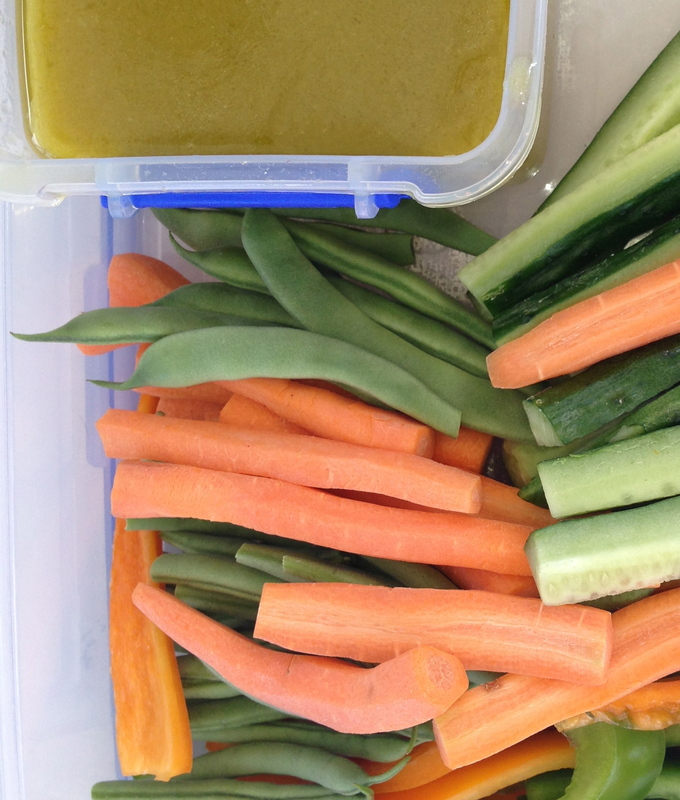 OK, it may not be rocket science… but it’s August and sometimes we just want to cut vegetables and use them as a vehicle for good dip. You can lighten this salad by omitting the goat cheese. However, this particular version was made with Bucherondin, a goat cheese log from Stinky Brooklyn. It is also tasty if you substitute sunflower seeds for the almonds. To reduce the vinegar, pour it into a small saucepan along with the brown sugar. Bring to a boil, and then reduce to a simmer. Stir frequently, and be careful not to burn the vinegar. When it reduces by about half, remove from heat. When cooled to room temperature, whisk in olive oil. I added a little bit of salt and pepper, put it in a sealed container and gave it a few shakes. 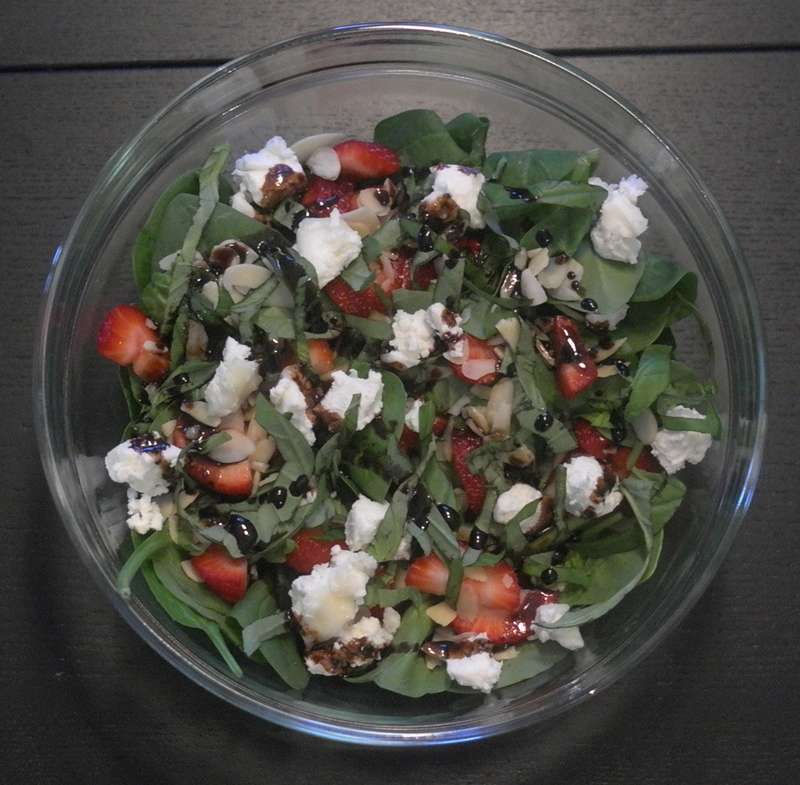 To assemble the salad, layer spinach, strawberries, goat cheese, almonds, and basil. Drizzle the salad with dressing just before serving. You will have extra dressing, which you can refrigerate and use at another time. 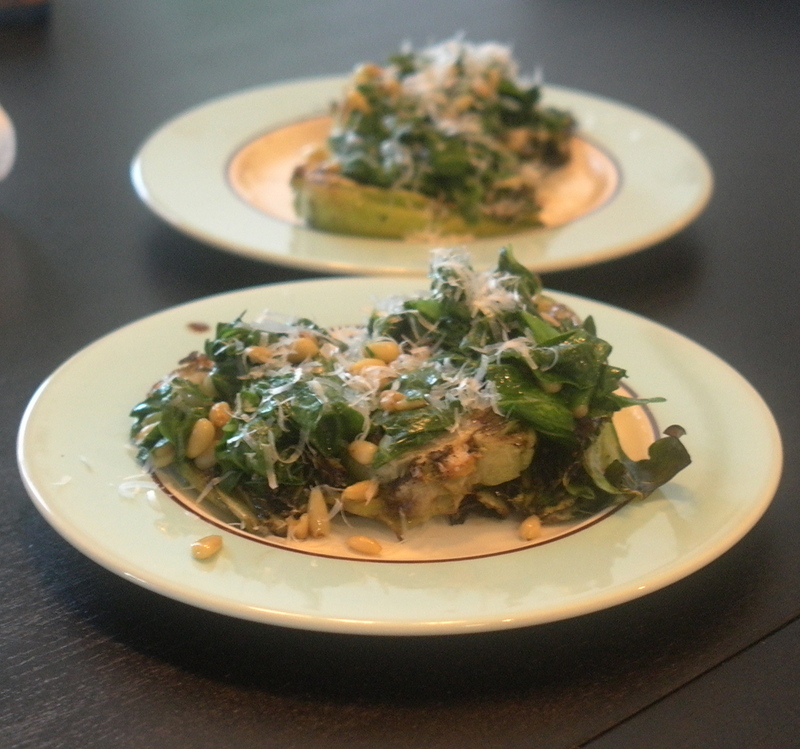 This simple salad was inspired by dinners at Frankie’s 457, including two of their salads: One has arugula and pecorino, and the other has a cipollini onion vinaigrette. 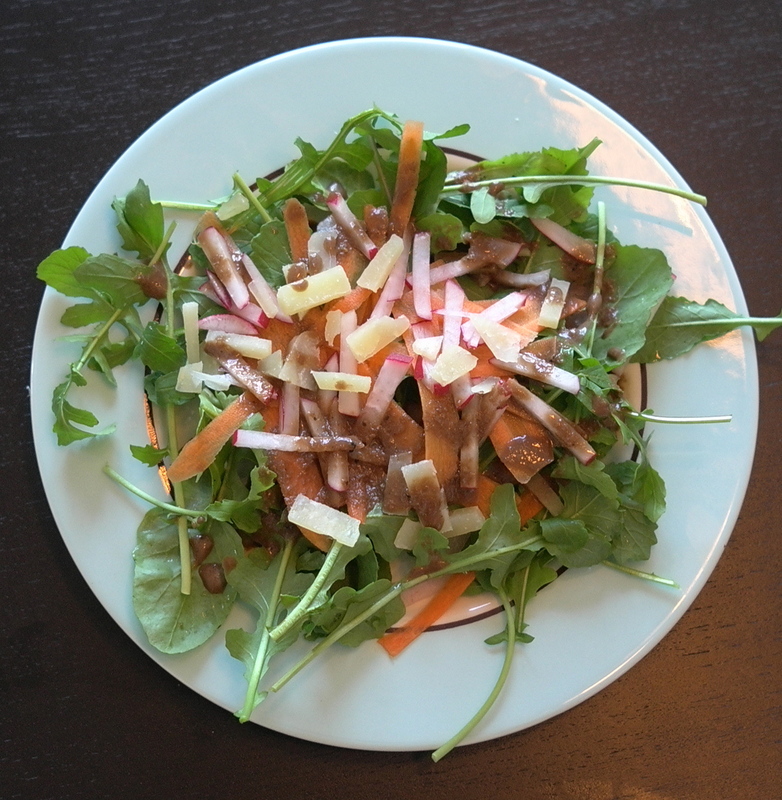 My version uses balsamic vinegar and vegetables that can be found at the winter farmer’s markets including arugula, shallots, radishes, and carrots. Although I don’t crave fresh, crisp greens quite as much during the chilly winter months, this pretty salad balances out a heavy meal. You can definitely substitute your favorite greens in place of arugula. 1. To make the dressing, peel and roughly chop the shallot. Pulse the shallot in a food processor until finely chopped. Add the vinegar, sugar, salt, and pepper, and pulse again. Add the olive oil and blend until smooth. 2. Layer the arugula, carrots, radishes, and romano on 4 plates. Drizzle with the dressing and serve. I guess I’m on a pear kick, so here’s another one. This is a variation of this Epicurious recipe. It has great fall flavors and can be made in very little time. It is easy to double the recipe so you can make a lot for a big group. 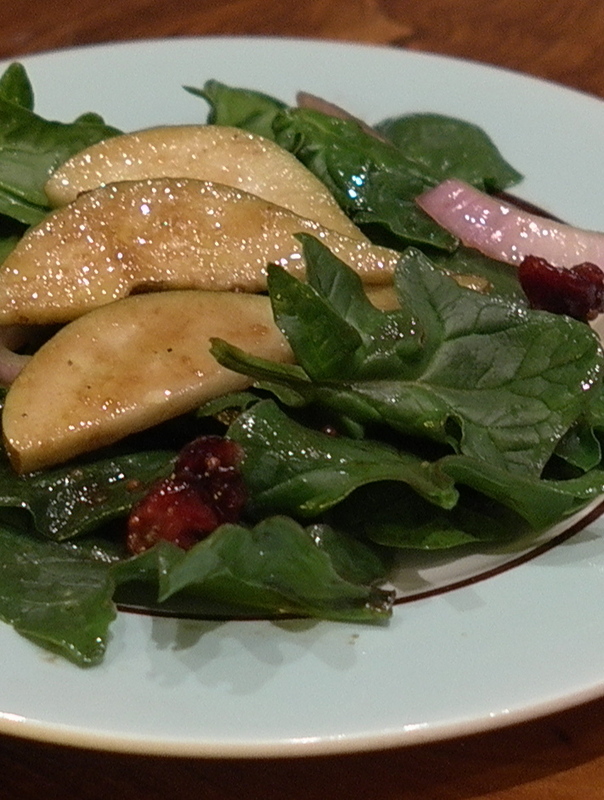 To assemble the salad, place the spinach, onions, and pears in a large bowl. Give the remaining dressing a last-minute shake and pour over the salad. Toss to coat evenly. Arrange the salad in a large serving bowl or divide it evenly among 8 salad plates. Scatter the cranberries over the top(s). Serve immediately. 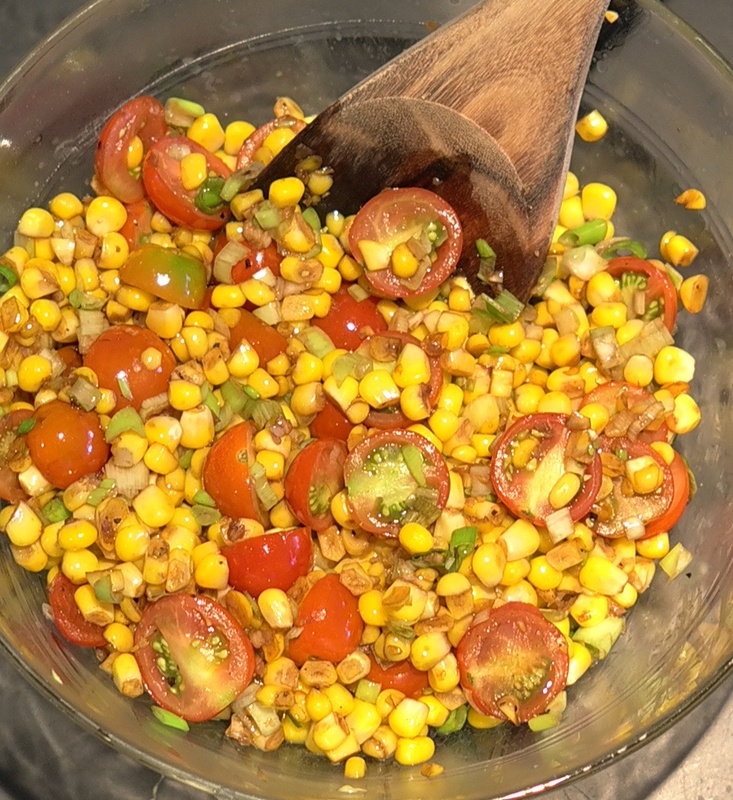 Corn and tomatoes play the starring roles in this simple salad, as the scallions and balsamic win best supporting ingredients. They all work together to create an interesting combination of flavors: an end-of-the-summer party in your mouth. Heat oil in a large heavy skillet over medium-high heat. Saute corn and season with salt and pepper to taste. Stir occasionally for about 4 minutes. Add the garlic and cook, stirring constantly for 1 minute. Add the vinegar and cook, until mostly evaporated, about 1 minute. Add tomatoes and cook, stirring gently, 1 minute. Lower the heat and add the scallions, stirring to combine. Remove skillet from heat and transfer vegetables to a serving plate. Season with salt and pepper to taste.